It’s easy to get carried away using superlatives to describe the small towns you’ll find in Greece. But, really, you need words like stunning, picturesque, scenic and beautiful in your descriptions. Anything else just doesn’t do these small villages justice. 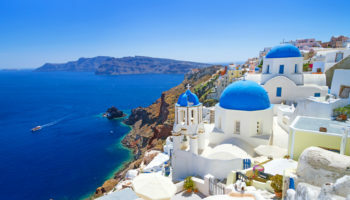 From sun-kissed beaches in the south to mountain villages in the north, the small towns in Greece emerge as memorable places you’ll want to visit again. And again. Picturesque is perhaps the best word to describe Fiskardo, a fishing village on the Ionian island of Kefalonia. Besides fishing boats, you’ll also find large yachts moored in the harbor. Fiskardo was once ruled by Venetians who left their architectural style stamped on the village. One of 365 villages on Kefalonia, Fiskardo is home to pebble beaches and sun-kissed coves, with trees down to the waterline. Fiskardo is a traditional Kefalonian village, made more special because it was untouched by a 1953 earthquake that destroyed most island villages. Parikia is another treat among Greece’s small towns. Built around the harbor, it is the capital and largest town on the island Paros. For many travelers it’s a quick stopover on the way to Santorini, but it you linger awhile, Parikia’s charms emerge. Parikia is relatively flat, so you can walk or bicycle to nice beaches. Start your tour at the old windmill in the town center, from there walking by whitewashed buildings with colorful doors and windows to the 13th century castle, the highest point on the island. Nafplio was an important seaport during the Middle Ages. 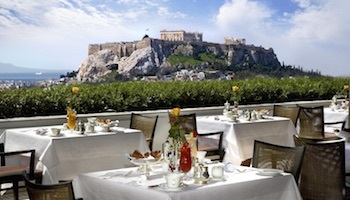 Still serving travelers, it is a popular day trip destination from Athens. 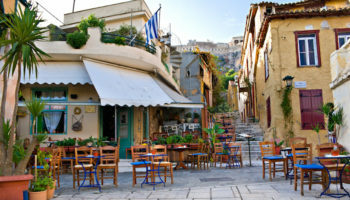 Nafplio features traditional Greek architecture though features from the days of Venetian rule can be found. A prime example of Mycenaean Revival or 20th century neo-Mediterranean architecture can be found in the building housing the National Bank of Greece. Sights to see include the clock tower, churches dedicated to saints Nicholas and George and the brightly lit waterfront at night. Metsovo, in northern Greece, is a popular winter destination because it’s close to skiing, but any time is a good time to visit this picturesque village. Stroll the cobblestone streets starting from the central square. Perhaps you’ll head up to the 15th century church of Agia Paraskevi, famous for its carved wooden temple. Or, you can visit a 17th century castle, a folk art museum or a monastery with a watermill or one with 17th century wall paintings. End the day by sampling locally made cheese and wine. Chora, on the island of Patmos, is likely to fit our pre-conceived notion of how a Greek island village should look: Old whitewashed buildings creep up a hillside that is capped by an ancient Byzantine monastery. The 12th century monastery dedicated to St. John the Theologian dominates Chora’s landscape. You reach the monastery by walking the narrow pathways to the top where you’ll be rewarded with stunning views of the Aegean Sea. Though it has only a few hundred residents, Chora is the island’s capital. The word “picturesque” doesn’t do Galaxidi justice. This small town on the Gulf of Corinth is considered one of the most scenic small towns in Greece. It’s hard to argue with postcard perfection. Galaxidi is an old naval town filled with mansions built by sea captains and now home to Greece’s most important shipping families. You can learn more about them at the country’s first maritime history museum here. Wander the streets to see these neoclassical mansions, maybe even stay in one that’s been converted to an inn. The name Agios Nikolaos translates as Saint Nicholas and for sure you’ll find a festive holiday atmosphere on this Crete island town. There’s something for everyone here: shopping, arts, pretty beaches, museums, archaeological ruins and three waterfronts to explore. If you’ve energy enough, you can hike a trail to a colorful nearby village, go scuba diving or play a round of golf. Fans of Daphne du Maurier may recognize Agios Nikolaos from the short story, Not After Midnight, that she set here. Mithymna, also known as Molyvos, is the tourist capital of Lesbos island. This picture-postcard town features brown stone houses climbing up the hillside, sandwiched between the sea and the Byzantine Castle of Mithymna, the key local landmark. Fishing boats fill the harbor while the town is surrounded by farmlands, including olive groves. Visitors give high marks to the hospitality found here, as well as stone houses decked out with flowers and the town’s overall charm. Some call it the prettiest town in Greece. A Greek TV show named Kalambaka one of the most beautiful places in the country. It’s easy to see why. Red-roofed houses fill a small valley between Meteora pinnacles, with some of the old houses extending right up to the rock. The narrow stone streets are just made for getting lost in, with colorful delights around every corner. 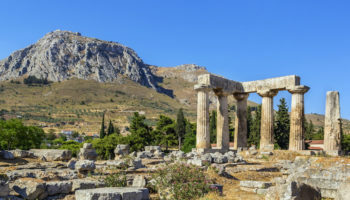 Remains of an ancient Greek temple can be found in a 10th century church dedicated to the Virgin Mary. Besides being the gateway to the famous monasteries of Meteora, Kalambaka is also a good place to buy handmade wooden souvenirs. Parga is the poster child for Greek beach resorts. Just ask the Greeks who are the town’s No. 1 visitors. This ancient town has sandy beaches, perfect for sunbathing or swimming. Take a break from the water to explore two historic castles, the 14th century Venetian castle that sits on a small peninsula and the ruins of Ali Pasha castle that overlooks Parga from a hilltop. Stroll through nearby orchards and olive groves. Buy some Parga honey to remember your visit when you get home. 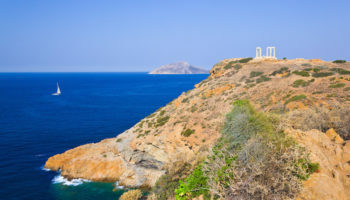 Mykonos is a good place to lose yourself in Greek mythology. 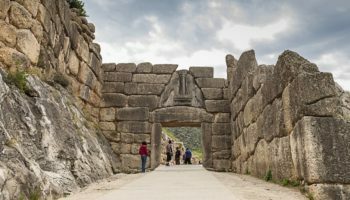 It’s named for Mykons, who was either the son or grandson of the Greek sun god Apollo. Mykonos Town sits on pretty rocky ground. It’s famous for its windmills that date back to the Venetians; some windmills have been converted to homes. You’ll also want to see Petros the Pelican who guards the waterfront and Little Venice, fishermen’s houses with balconies that extend over the water. The colorfully decorated white houses give Mykonos a cosmopolitan feel. Symi used to be a center for shipbuilding and sponging, but today it is a magnet for travelers. With waterfront cafes and benches overlooking the water, Symi has a cosmopolitan feel as homes climb the hillside on this mountainous island. Since it’s built on a hill, pace yourself as you go from one site to another. 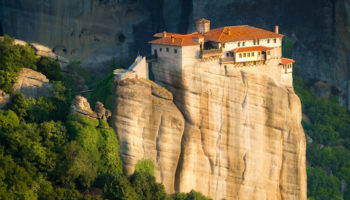 Top attractions include an 18th century Greek Orthodox monastery, a castle overlooking the city that was built by the Knights of St. John, and numerous churches and chapels, some built by the Byzantines. A causeway links the island village of Monemvasia to the Greek mainland on the Peloponnese coast. 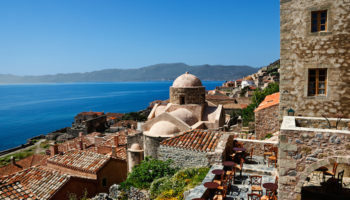 Monemvasia is a medieval town well noted for its architecture, with red tile roofs topping rustic colored buildings. With waves crashing against the rocks, this former fortress village is quite picturesque. Previous visitors have called Monemvasia a magical, fairy tale place that’s perfect for romance. You’ll be enchanted to when you see the old castle toping the island. The walled village shows off its Byzantine, Venetian and Ottoman past quite well. 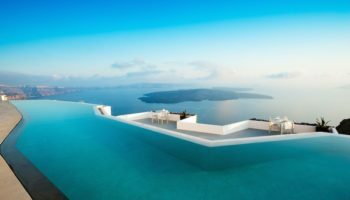 Oia has been attracting travelers since the 13th century. 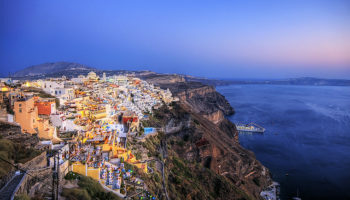 It’s continued over the ages until today it is one of Santorini’s top tourist destinations. 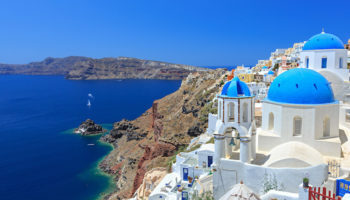 People come here for the dramatic views, stunning sunsets and to look at the old captains’ houses – Oia was once a powerhouse in the shipping trade. Buildings are snow white; churches are topped with deep blue domes that match the water surrounding the island. The village is car-free, so you can safely walk the narrow streets, strolling among the many art galleries. 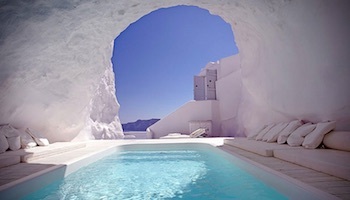 I ve been to Greece twice! The islands are spectacular and the ambience is amazing. Everyone needs to experience the beauty & culture of Greece! It s an unforgettable vacation that you ll treasure forever!! We have visited 7 of the 14 places. We will be working on the others next visit. Our most favourite of all those beautiful spots is Fiskardo. Great food,restaurants & locals. Fantastic little beaches close to town.